This Batman costume accessory kit is from the movie "Batman: The Dark Knight Rises". This kit is perfect for creating a quick and affordable Batman costume for Halloween or dress-up play time. 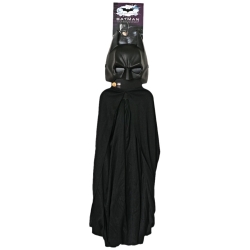 The Batman costume accessory kit includes a child size mask and cape. One size fits most children.